I tried to read at Barnes & Noble one night, but it just hit too close to home, you know? Now I can read it in the privacy of my own home (ha. more or less) and cry if I want to. That was me…but I still think I was a burden. I wanted to send this to someone for Christmas, but wondered if it wouldn’t be too painful. Let me know what you think. If you think it would be OK, put me for the drawing. I’ll read it myself and then pass it on to her. I would like to read it. I enjoy his take on things. It’s funny, but when I read that book a few months back, I wrote the exact same quote in my blog. Having children, raising children, it’s a lot of work, but it’s a labor of love- or at least it is to me. A lot of hard work but also the best thing I’ve ever done. That book made me cry as did his other books. I’m not a person who cries easily. 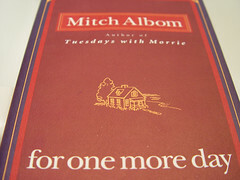 Some people think his books are too sappy, but I liked them. I think it is awesome that you are passing the book on- what a cool idea! I think it sounds interesting, count me in. this sounds like a powerfully moving book! I read it a couple weeks ago and enjoyed it.